The third consecutive Lakeland walk that I've started from Grasmere. This is in no small part due to road conditions and minimal daylight hours; get there safely and early and get on with it, I say. 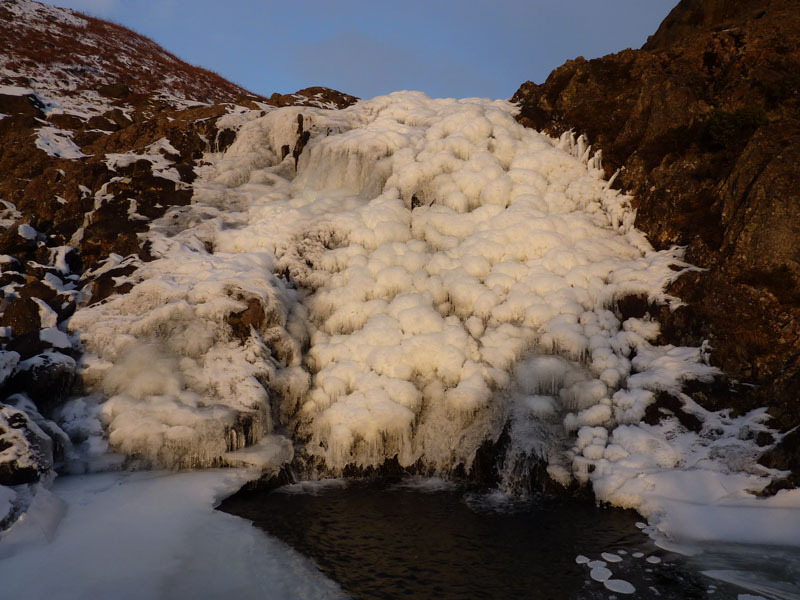 There was one main objective to this walk and that was to see frozen waterfalls, rivers and tarns - I was not disappointed! I parked on the roadside in Grasmere and set off for Easedale. 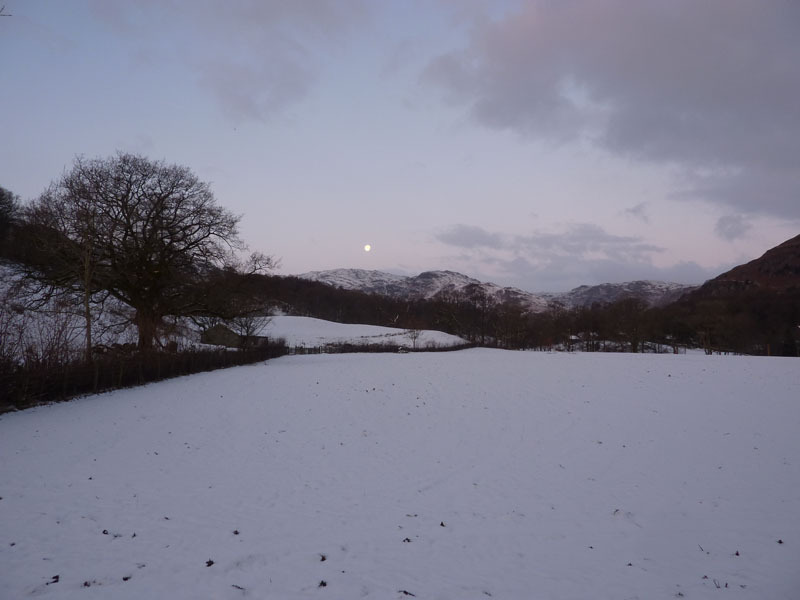 The moon is visible above High Raise with Tarn Crag to the right. 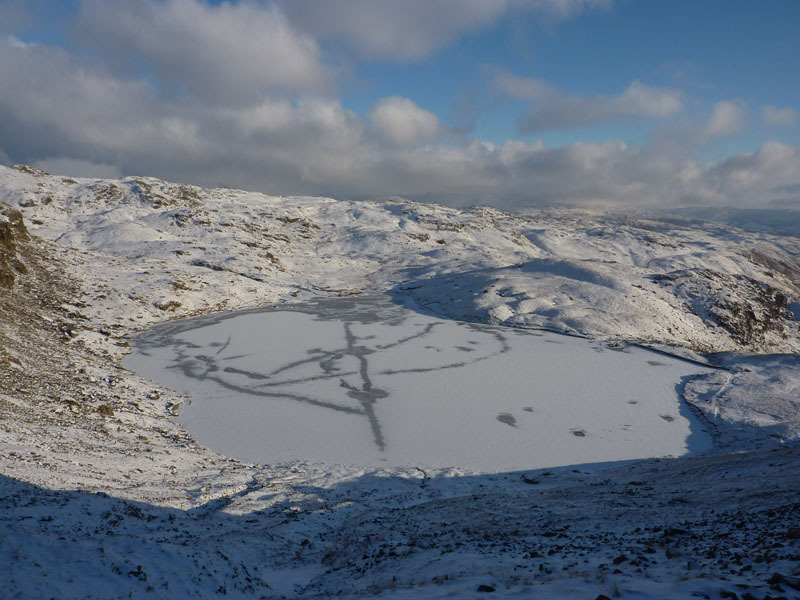 The current plan is to climb Blea Rigg then take a route via Stickle Tarn to Thunacar Knott, then High Raise, Sergeant Man and maybe Tarn Crag - quite an agenda for a short winter's day. 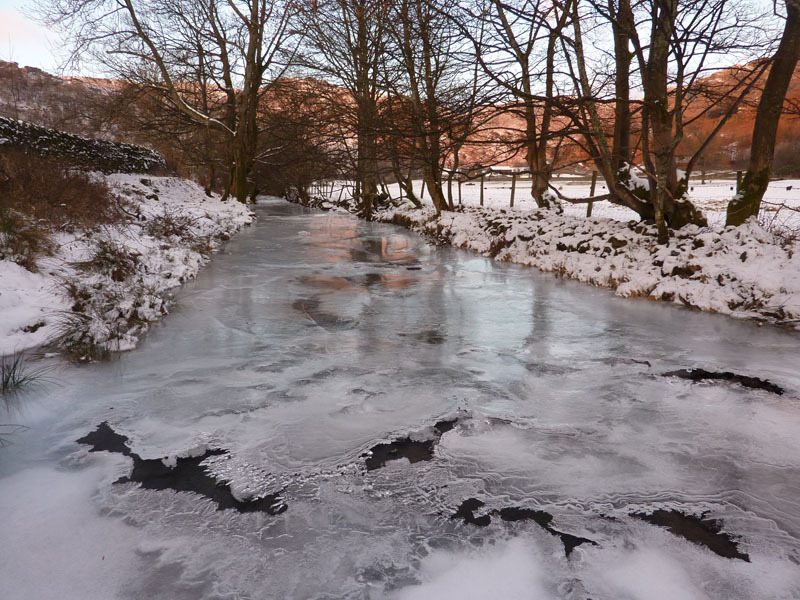 The river has frozen over and water is currently running underneath. Look at the icy path. I had not set off with crampons on and this was a little tricky. Wansfell features on the horizon. Just what I've come to see. Not the first time I've seen this in ice, but the first time I've had a digital camera in my hand at the same moment. 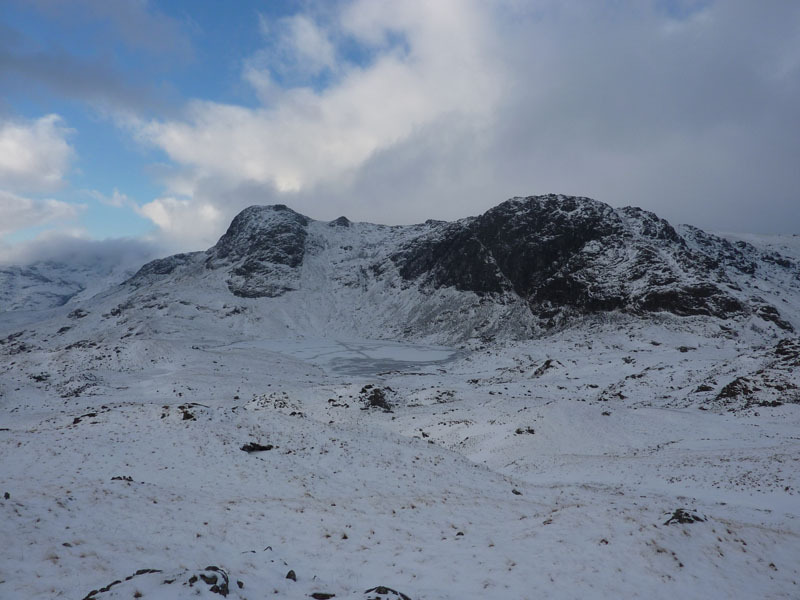 I put my crampons on to enable a look from the other side of the gill. So, three out of three. 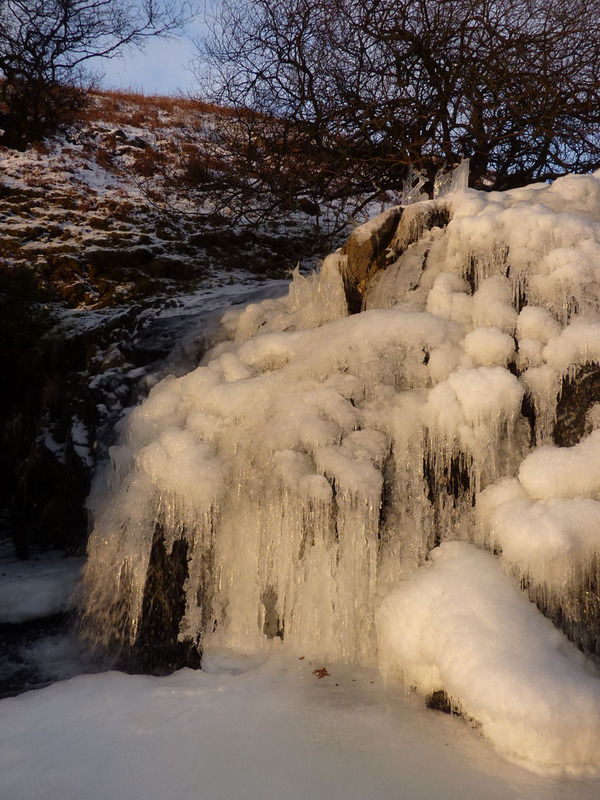 River, falls and tarn all frozen. 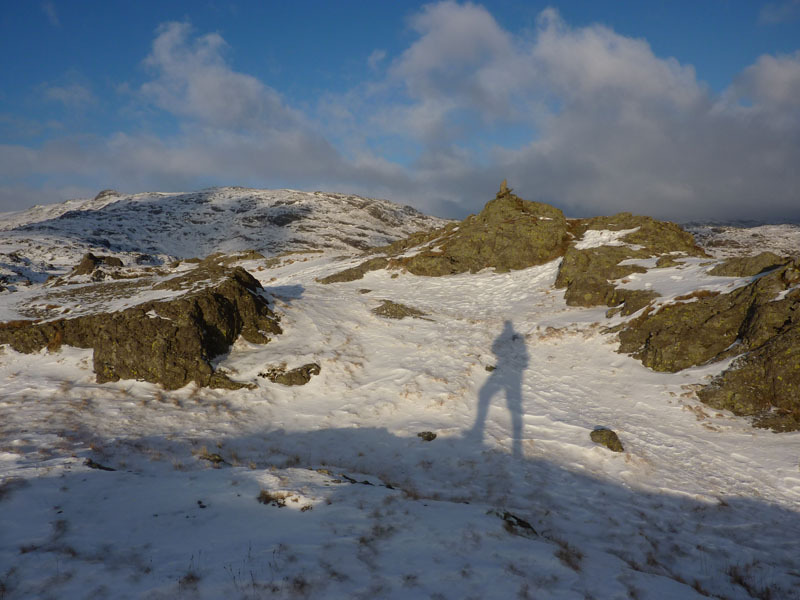 Just me in the whole of the area around Easedale Tarn at this time. I'm stood in the shelter of the "big boulder". 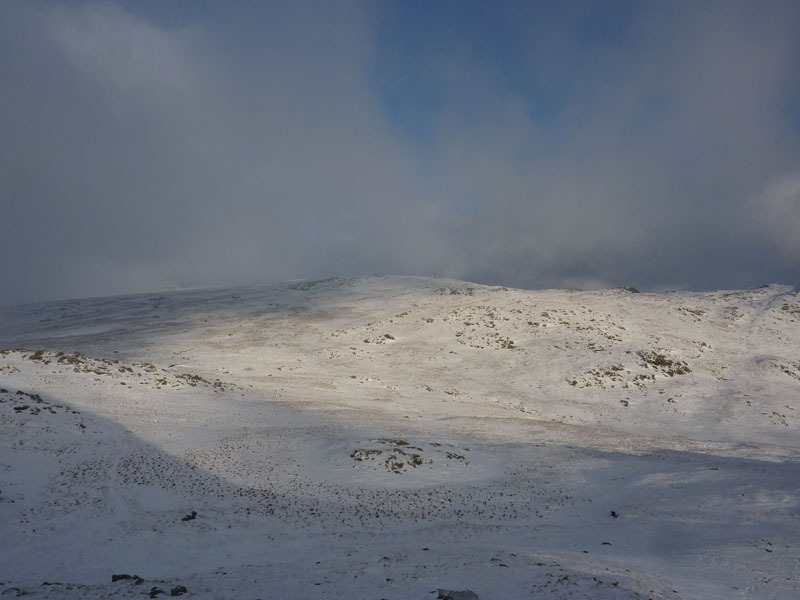 I ascended using Wainwright's suggested direct route as per BR6 in his Central Fells book, I started behind the hut (?) and then the big boulder - well at least one of these features has stood the test of time. 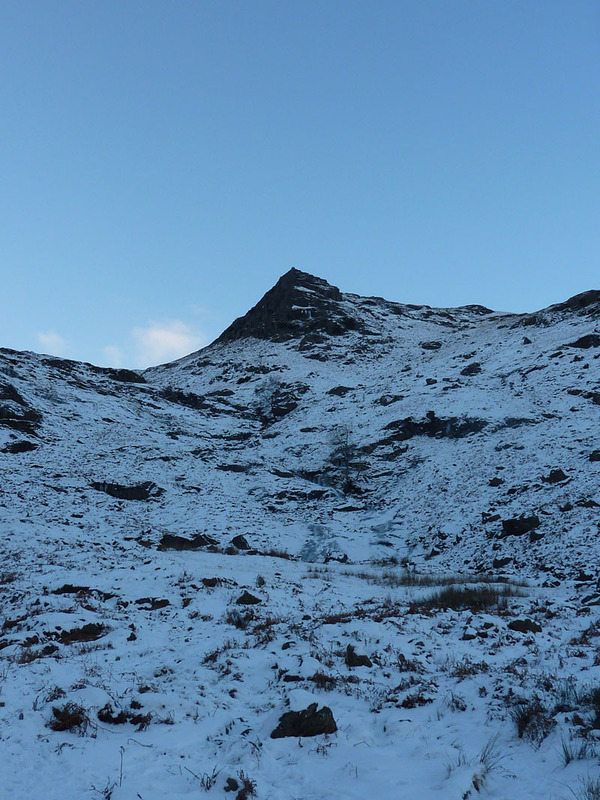 Home of Jack's Rake - the diagonal right-to-left climb up the face is clearly visible here. These were the first two people I met on this walk. A couple from Scotland on holiday - three hours into the walk. They turned out to be the only people who I came close enough to greet on the whole of the walk. Now then. Crop Circles, Caveman's Heiroglyphics, What do these markings mean? Could it be the result of the earthquake felt in Cumbria on Wednesday morning? 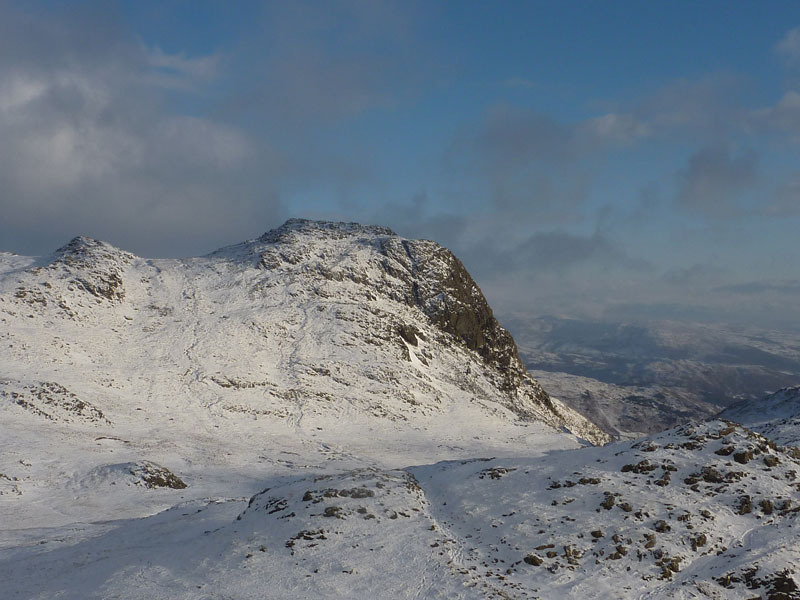 Cloud has descended and persuaded me to go to the summit of Harrison Stickle and have a think about further summits. 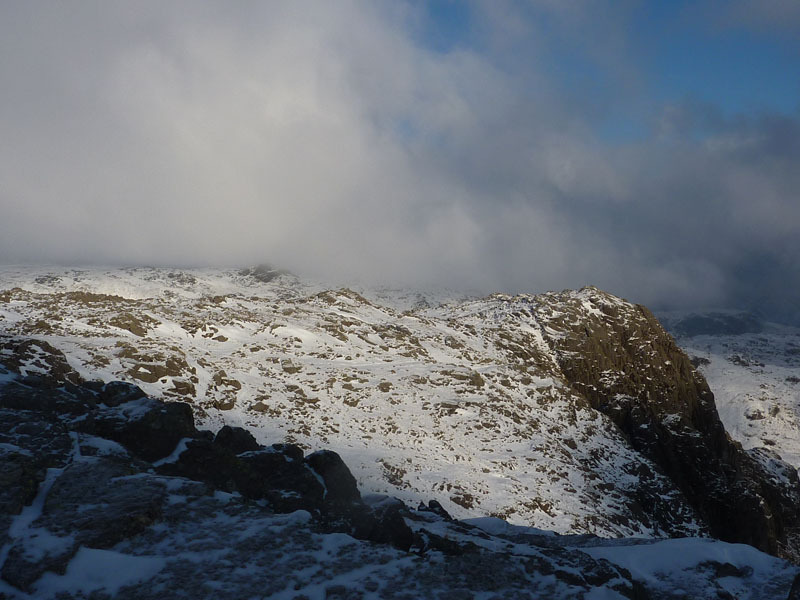 From Pike O'Stickle and I can now see a clear route to Thunacar Knott (out of pic). 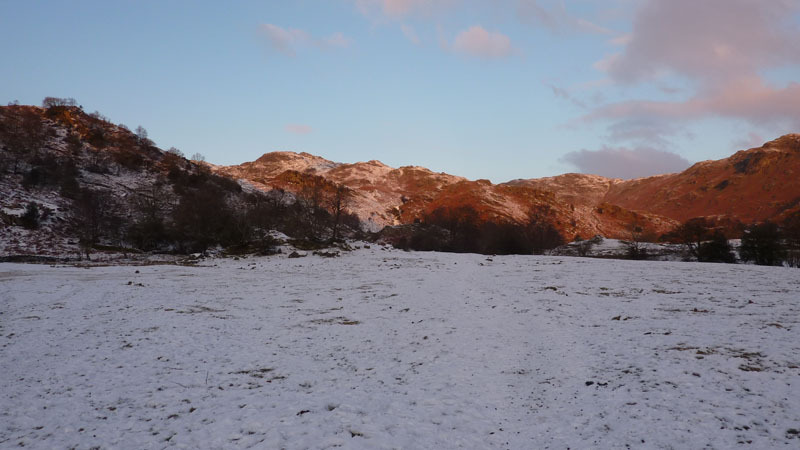 In clearer conditions, it will be better for me to head to TK rather than drop into Langdale, from where I would need to find a way back to Grasmere. The route leads off from the bottom left of this photo. TK is not the bonniest of Lakeland bumps. Thunacar Knott has its detractors. 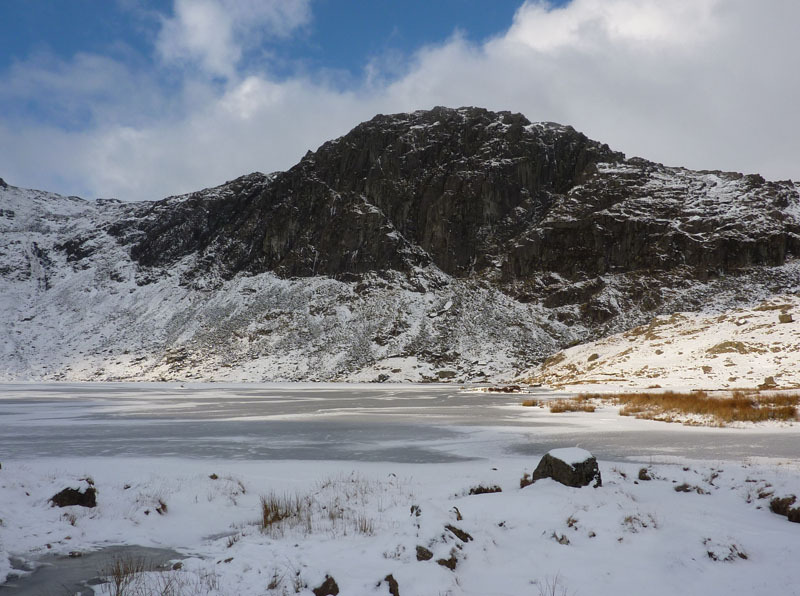 This bump never asked to be "Wainwrighted", I reckon that if TK's top was at a lower altitude than Pavey Ark, AW may not have troubled himself. 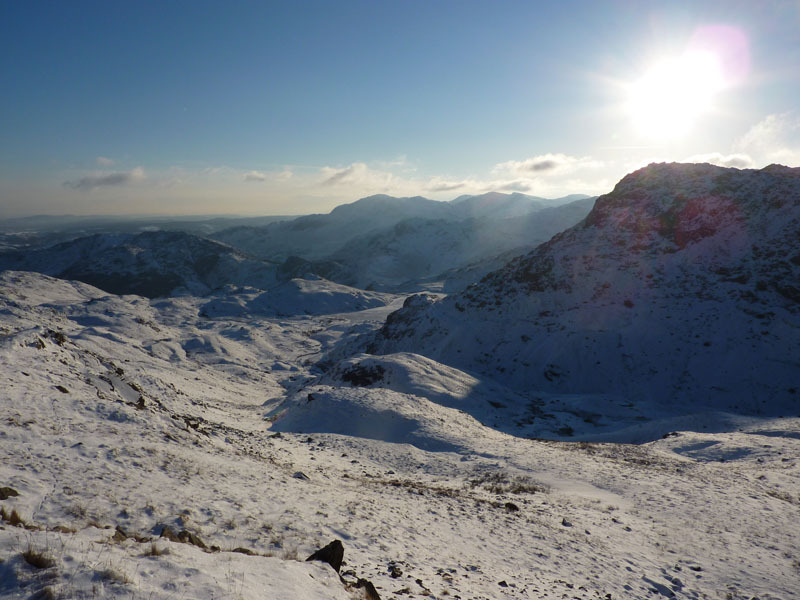 In its defence, everytime I have been here, I have been rewarded with those precious commodities: peace and quiet, you don't get much of that on Scafell Pike. 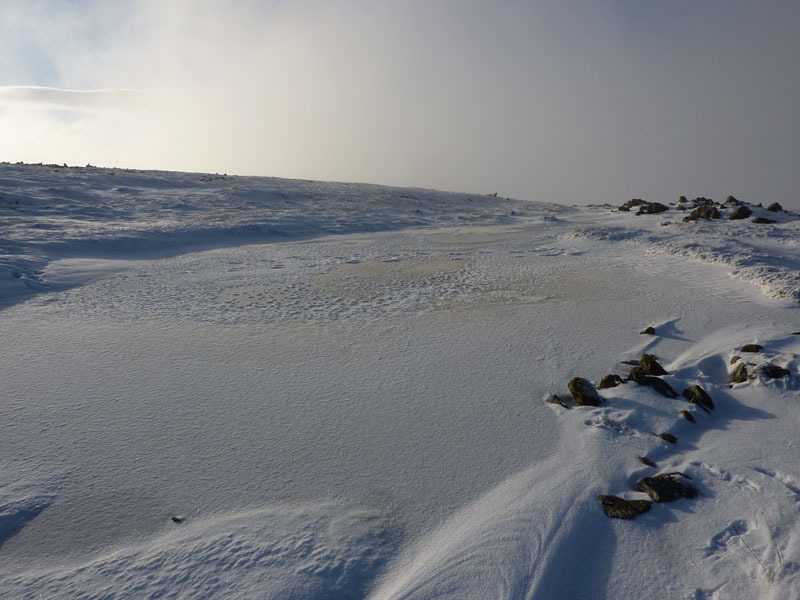 I took an easy direct route across the frozen landscape from TK towards SM and decided that time was not on my side. 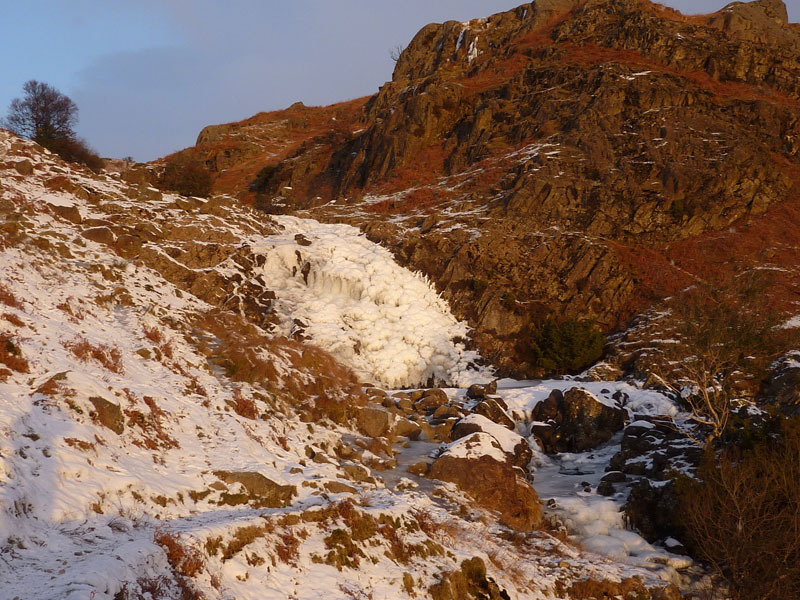 If I went to the top of this fell, the extra time might have me descending across icy paths in fading light. 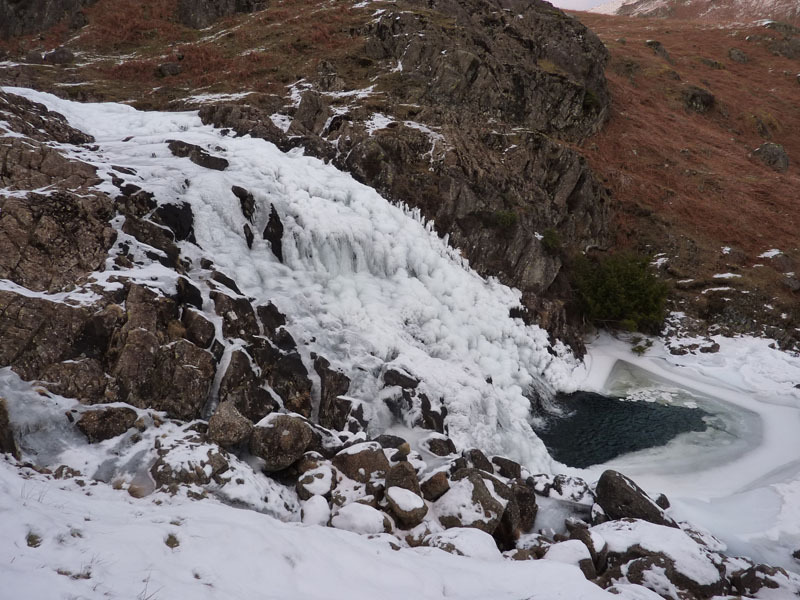 The North-West edge of Pavey Ark. 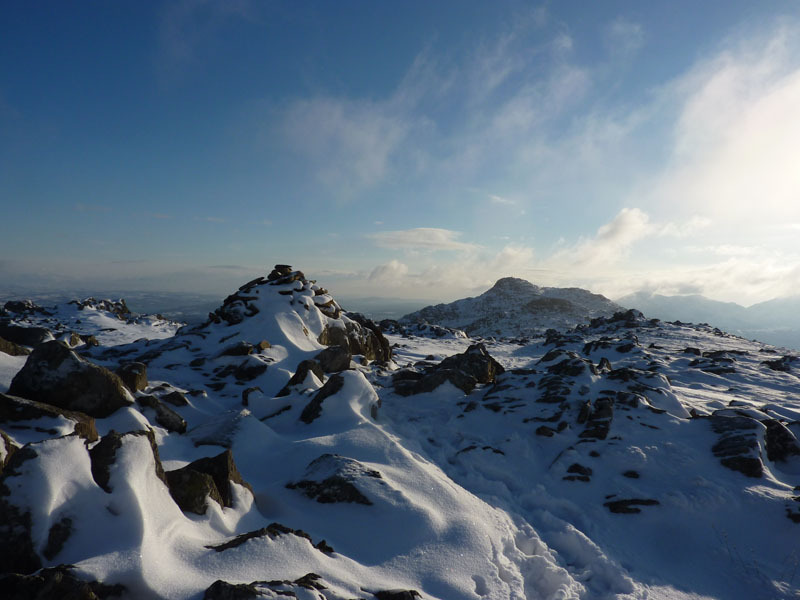 The reason why I did not visit the top of Pavey Ark is simple - I will not tick the box that says I've climbed Pavey Ark if I haven't done so directly by one of the steep ascents. I hope that there is no one out there that boasts a climb of PA and has only ever done so by wandering across the ridge from Thunacar Knott. Not really looking forward to this. 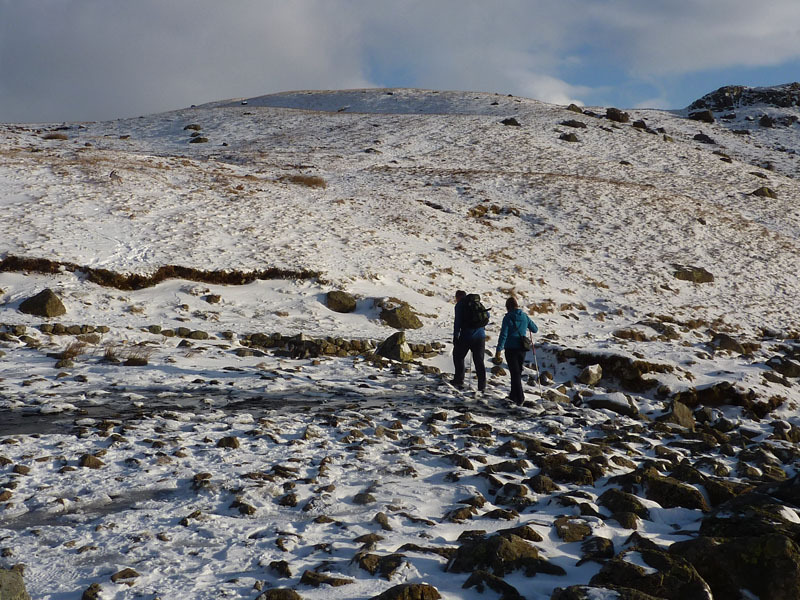 Crampons on, I expected it to be icy. 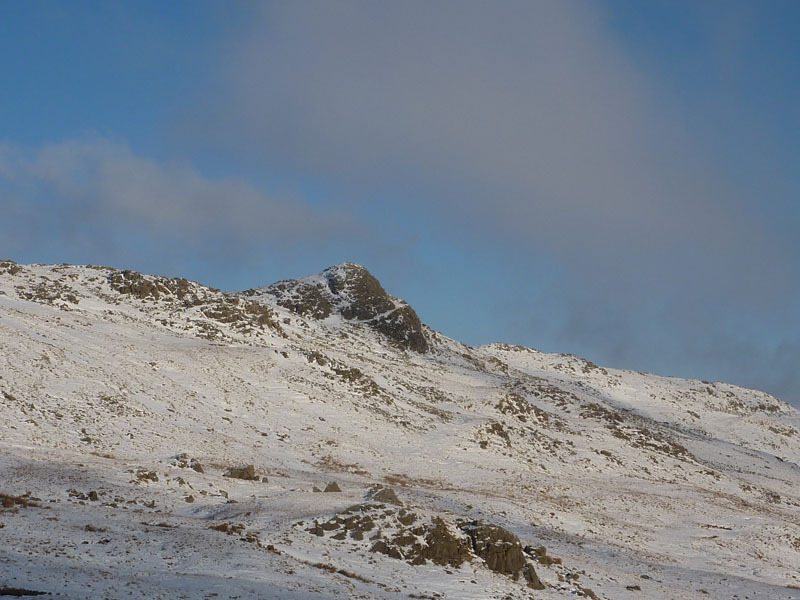 The rocky outcrop on the away down is Belles Knott and the path goes down to the right of this feature. 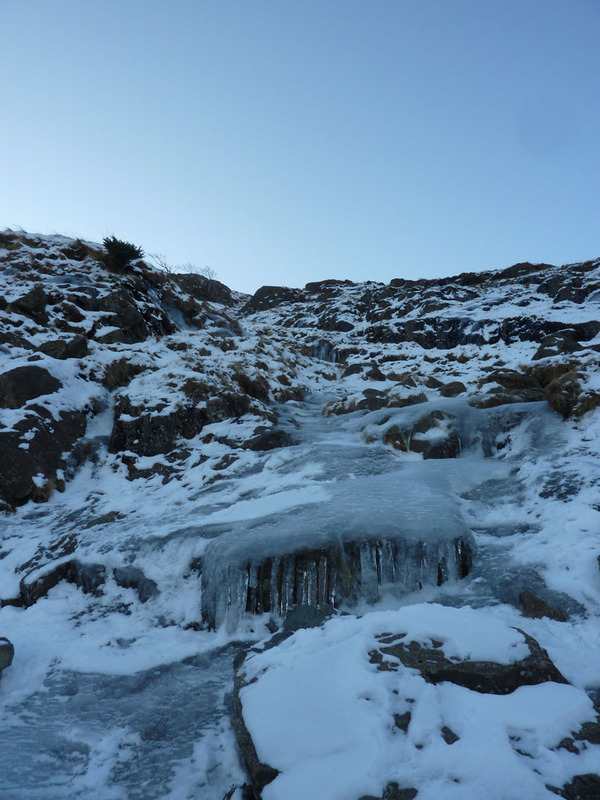 The path was covered with ice, really not passable for anyone without any form of boot grip. 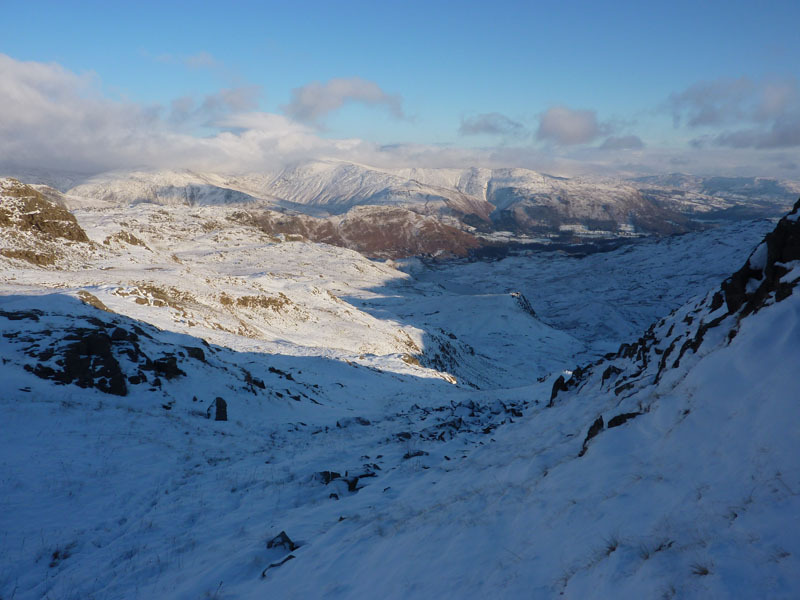 Belles Knott is the "Matterhorn" of Easedale. 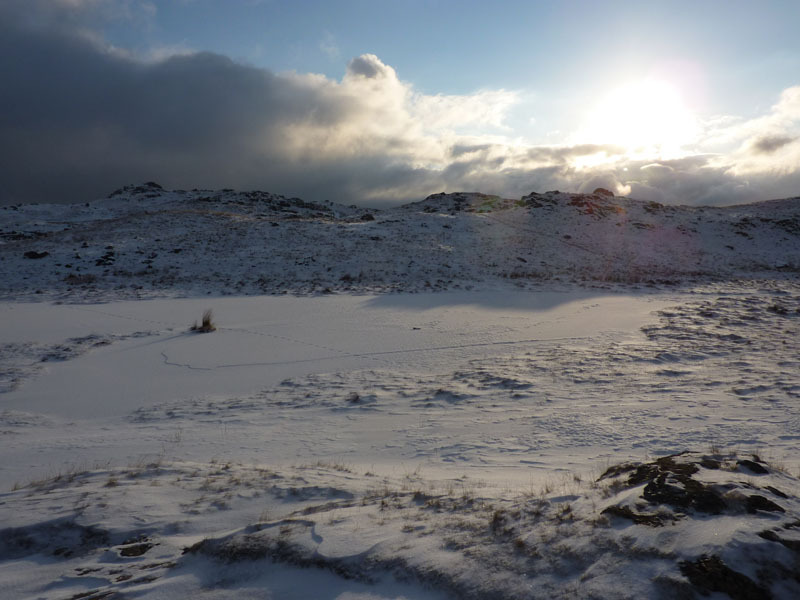 Easy walking across frozen bogs, indeed it was better to avoid the footpath now that I'd taken off the crampons as the path is mostly icy. 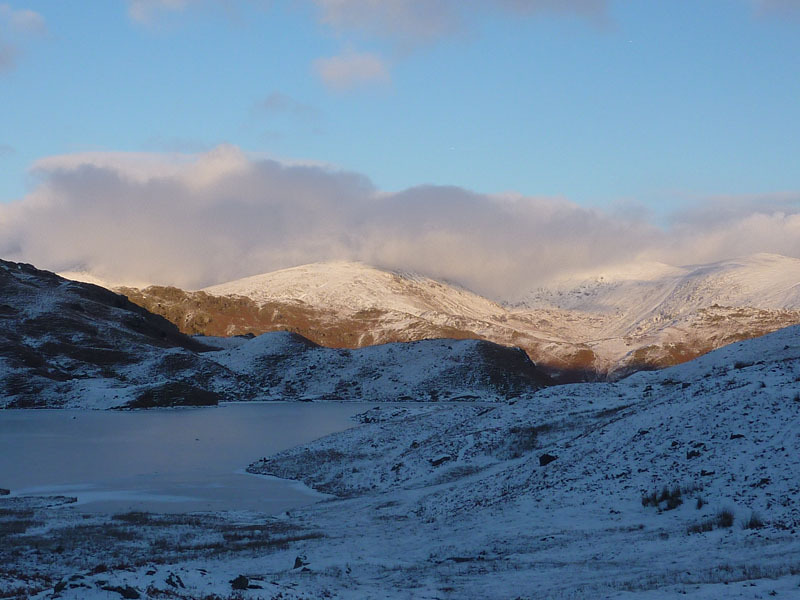 I wonder what conditions were like on the high Eastern Fells today? 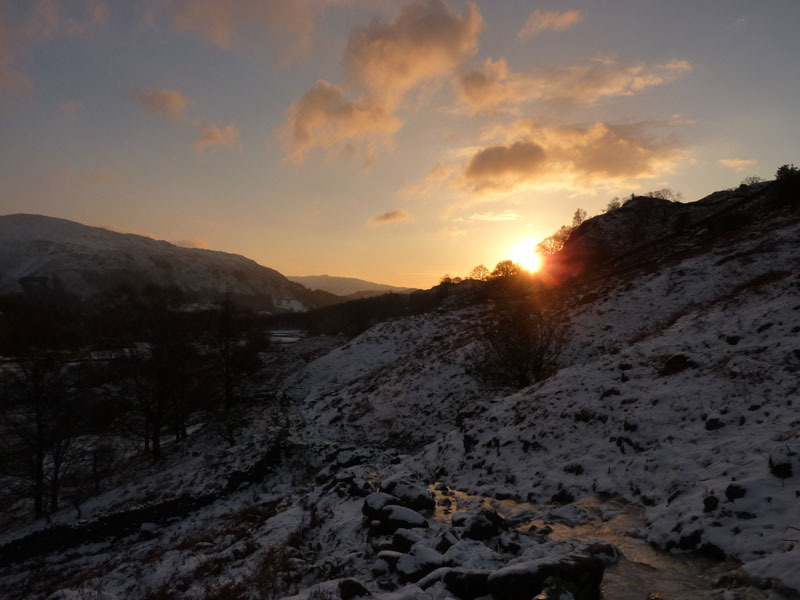 The valley is firmly in shade and I hope to get back to Grasmere before all the cafes close, a warm drink would be most welcome. I left Grasmere at 08:25 and returned at 16:05, just in time to see chairs being put on tables in the first two tearooms, but the third one was still open and I had my first warm drink since 05.30 this morning. 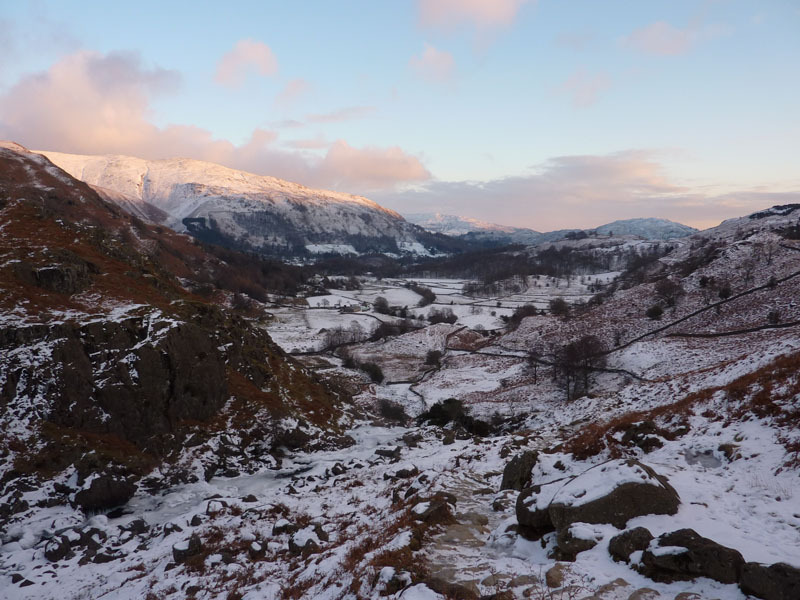 I like to get in one Lakeland Christmas Walk each year and this could turn out to be the one, but hopefully weather and family commitments will allow another before work resumes on Jan 4th. Time taken: 7hrs 40mins over a distance of approx. 10.5 miles. 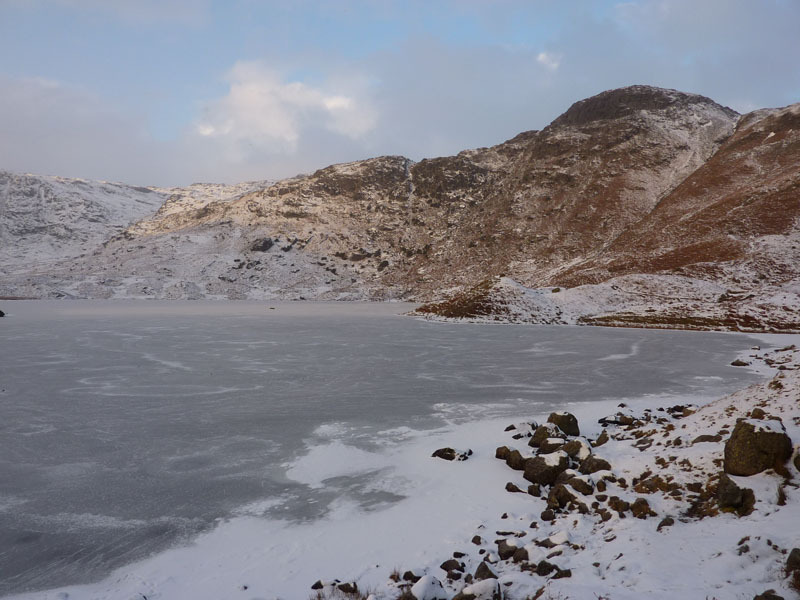 Route: Easedale Road, Easedale, Easedale Tarn, Blea Rigg, Stickle Tarn, Harrison Stickle, Pike O'Stickle, Thunacar Knott, across the top of Bright Beck to Belles Knott, Easedale Tarn, Easedale, Easedale Road, Grasmere. 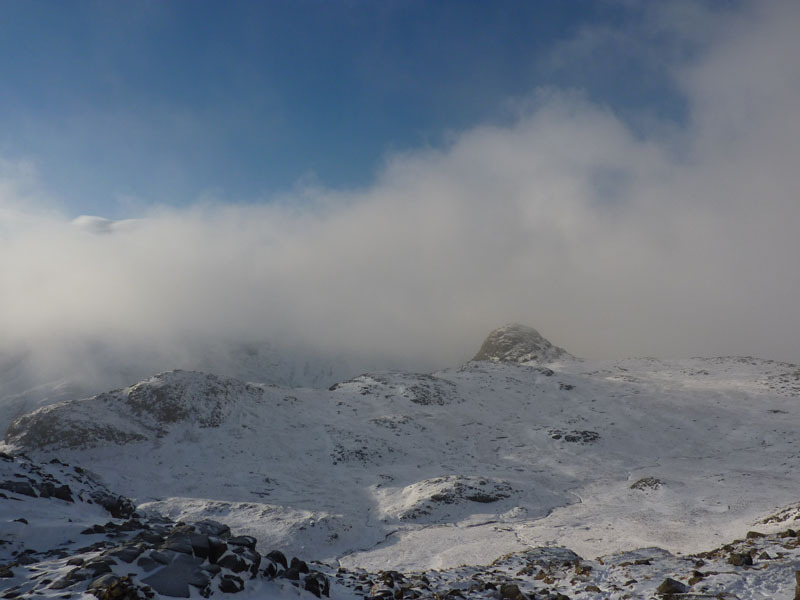 Weather and conditions: Mainly sunny and clear, but wispy clouds around mid-day and quite a bit of the day spent in the shade of Blea Rigg. Cold, but not windy. 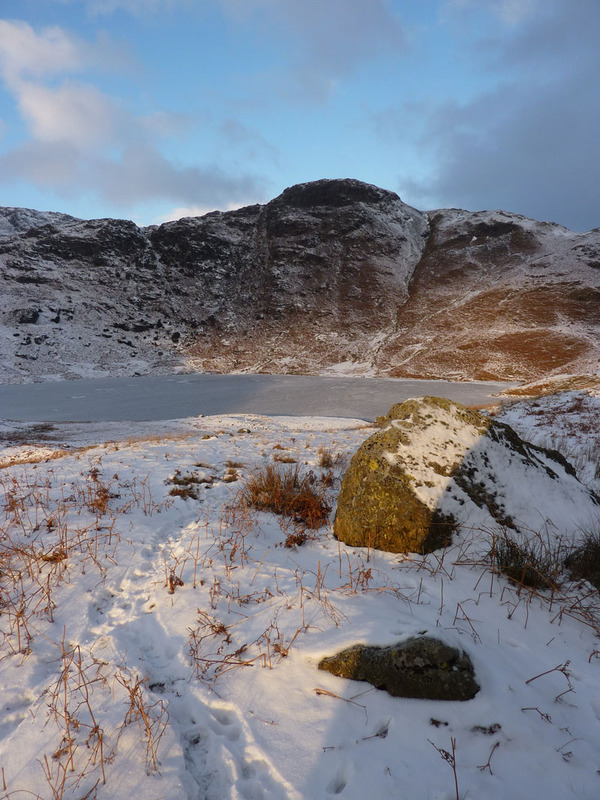 Greetings Count: One greeting and chat at Stickle Tarn, I saw other folk here and there, but never on my path. 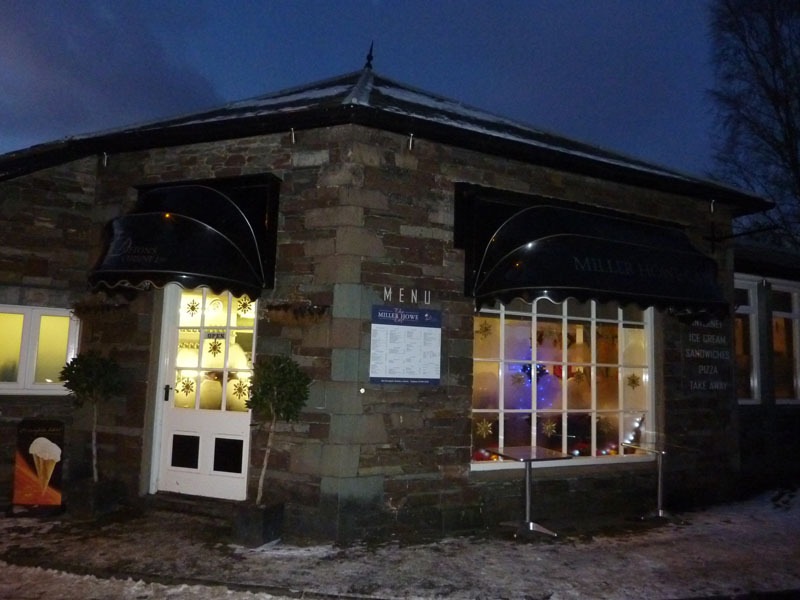 Richard's Refreshment Review: Tea and shortbread at Miller Howe Cafe, Grasmere. Usual opening times: 09:00 to 17:00. Clean and plenty of choice, I seem to remember eating in here many years ago with the rest of the family and coming away thinking it was expensive. But it's cheaper when I'm on my own.